Monday July 1st 1889 It was a very warm day. The girls were here a little while in the morning. I sat up some toward evening. The Dr was here. Tuesday July 2nd 1889 I was very sick all day. Mother put up some berries. Will was very busy with his work all day. A letter fron Joe Woolf. Wednesday July 3rd 1889 weather some cooler. I felt a little better. The Dr was over to see me in the forenoon. The girls were here awhile Mother and Agnes washed. Will is busy with his corn plowing. 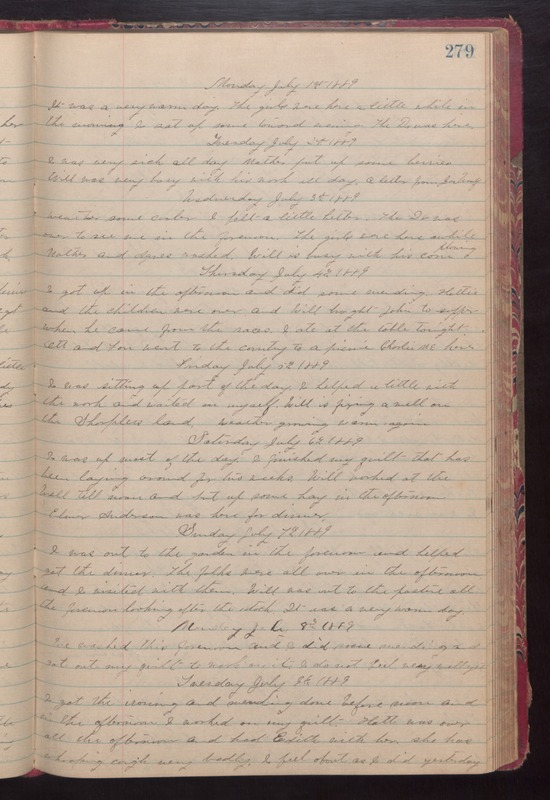 Thursday July 4th 1889 I got up in the afternoon and did some mending. Hattie and the children were over and Will brought John to supper when he came from the races. I ate at the table tonight. Ott and Fan went to the country to a picnic. Charlie Mc here. Friday July 5th 1889 I was sitting up part of the day. I helped a little with the work and waited on myself. Will is fixing a well on the Shurplers land. weather growing warm again. Saturday July 6th 1889 I was up most of the day. I finished my quilt that has been laying around for two weeks. Will worked at the Well till noon and put up some hay in the afternoon. Elmer Anderson was here for dinner. Sunday July 7th 1889 I was out to the garden in the forenoon and helped get the dinner. The folks were all over in the afternoon and I visited with them. Will was out to the pasture all the forenoon looking after the stock. It was a very warm day. Monday July 8th 1889 We washed this forenoon and I did some mending and got out my quilt to work on it. I do not feel very well yet. Tuesday July 8th 1889 I got the ironing and mending done before noon and in the afternoon I worked on my quilt. Hatt was over all the afternoon and had Edith with her. She has whooping cough very badly. I feel about as I did yesterday.